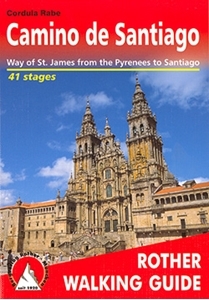 The Rother walking guide to the Spanish Camino de Santiago has been so popular in such a short space of time that this new second edition has been prepared after only one year. In a total of 41 stages the whole of the Camino francés is described from Saint-Jean-Pied-de-Port via Roncesvalles, as well as the Aragon route from the Somport pass via Jaca to Santiago de Compostela, including possible secondary routes and the extension to Finisterre or Muxía. The guide includes 47 maps at 1:100,000 scale, 6 town plans and 2 overview maps for planning. There are precise descriptions of the individual stages including easy-to-read height profiles, as well as comprehensive details of the infrastructure along the way such as medical services, shopping opportunities or banks, make your planning of the walk easier, especially for deviations from the stages described in this guide. Detailed information is also given about the location and standard of accommodation in the pilgrim hostels along the way, graded accordingly with one to three pilgrim shells. General tips on planning the route and equipment at the start of the book make this walking guide into a compact and practical guide. A special mention is also made of historical and scenic delights, as well as regional peculiarities, local fiestas and culinary specialties; over 60 photos provide insights into the diversity of landscape and cultural experienced along the Way of Saint James. Rother Walking Guides were first published in 1920- since then Bergverlag Rother have continued to produce these comprehensive guides to “the finest valley and mountain walks”. Each book has a detailed description of walks, small walking maps and many tips on combining the walks, places of interest, accommodation and public transport; the guides are all in full colour with varying scales and types of cartography - the walks themselves vary from day-long hikes to mountain and valley walks, with varying levels of ease and difficulty indicated. Small enough to fit in your pocket, comprehensive enough to take you everywhere; the books are printed in paperback but with a polytex-laminated cover, making them extremely durable too.